Thinking of bringing home a Rottweiler puppy? You will have a lot of questions. And possibly some concerns too. Let’s find out whether this is really the right breed for your family. Our readers’ have a lot of questions about Rottweilers. In this article we will be taking a look at the iconic breed. From temperament to training, health to lifespan. Allowing you to get to know this fascinating dog. And to decide whether they would suit your lifestyle. They are famed for their protective devotion to their owners. Often known as ‘Rotties’ they are loyal to a fault. This is a breed with a serious depth of character. Although Rottweilers are well known as guard dogs, there is a lot more to their past. The history of the Rottweiler is an interesting one. Their name is thought to have been derived from the name of their German town of origin Rottweil, pronounced “Rott-Vile”. 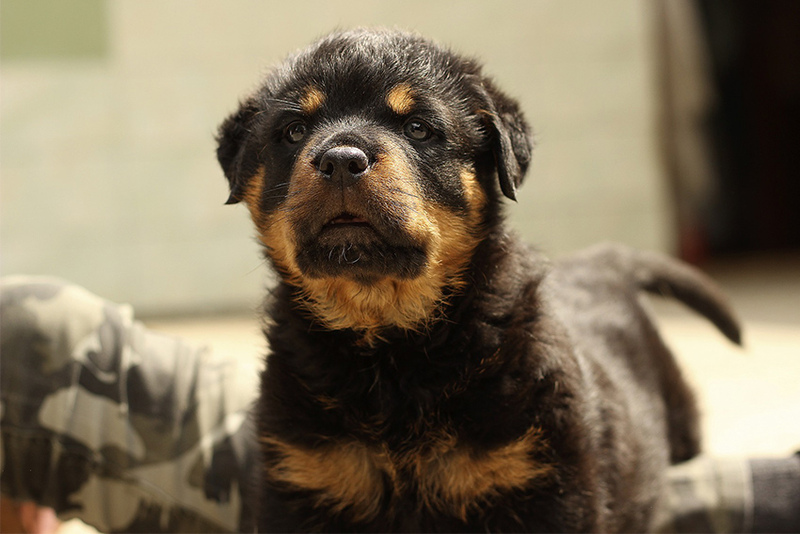 Rottweilers were bred to accompany herds, protecting them from predators and poachers. From these routes they have been also been used to help hunting large predators such as bears, and even for pulling small carts. In more recent years they have played roles in some countries police, military and customs departments. There were many breeds of dog put to the same use as Rottweilers, who probably make up parts of their ancestry. These include the Molossus, Bernese Mountain Dog, Greater Swiss Mountain Dog, Appenzeller and Entlebucher. As they were involved in cattle drives, they could have potential met far more breeds along their journey. The original breed standard was compiled in 1901 in Germany. The first Rottie was imported to the UK in 1936, however they did not gain popularity in this country until the 1960s. You can find a full and fascinating history of the Rottweiler here. The Rottweiler is a large, well muscled and powerful dog. They have a broad head and barrel chest, with a well proportioned body and level back. Their ears are titled and their muzzle should be long, with wide nostrils. They should display be strong but manoeuvrability and have good endurance. Their forehead should be arched and their muzzle deep. 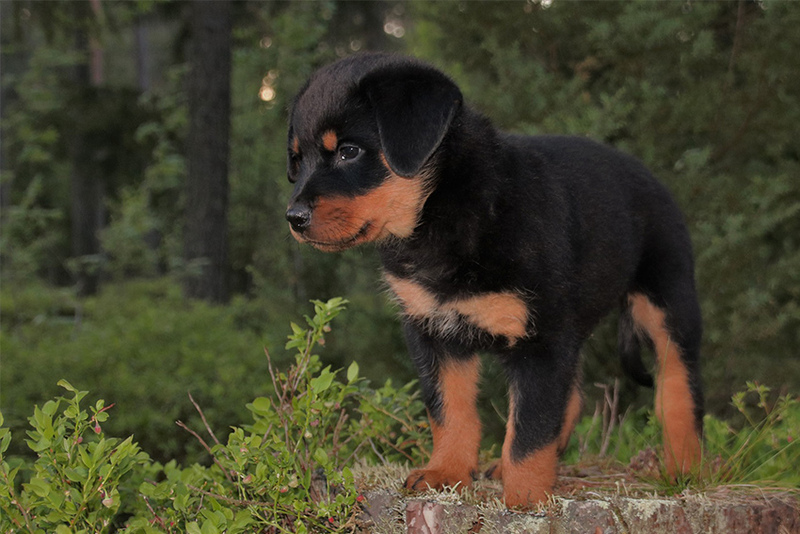 Rottweilers are black and tan in color. They have short, coarse, dense coats of fur and neat markings. Rottweilers have tan eyebrow markings above their eyes, as well as on their muzzles, chests and feet. These dogs have short, easy to manage coats with a top coat and undercoat. The top coat will be medium, coarse and flat. It should be a little longer on the backs of their legs, but should never be long or wavy. They do shed although not too much. You can get away with grooming once or twice a week to keep their coat in a good condition. Rottweilers are very large dogs. They can weigh up to 110 lbs and stand up to 27 inches high at the shoulder. They are packed with muscle, and as such make very strong and powerful dogs. Rottweilers have a reputation for being tough dogs, but they are also generally very calm and biddable. Although they are undeniably dangerous in the wrong hands, this doesn’t have to be the case. They are loyal and loving to their families, although they are also defensive of them and their homes. When well socialized, he will be a brave and confident dog. Although he is unlikely to ever be pushy or overly friendly with people he doesn’t know. As big, powerful dogs, Rottweilers can do a lot of damage to your home if improperly managed. Separation anxiety or sheer boredom can result in extreme chewing. If inadequately socialised your pup will almost certainly guard your home against visitors. A well socialized Rottie will not be overly friendly with your guests, but will be comfortable with them coming and going. He will be affectionate with his family, but aloof with everyone else. This is an attribute which some people love about them as a breed. But also one which has caused them to fall into trouble in the wrong hands. For most homes where a pup is primarily a family pet, these guarding instincts can be trouble if they are improperly managed. Do not attempt to dominate your Rottweiler, instead work with him in a positive manner. Help him to learn that spending time with you is a happy and rewarding experience. Fortunately, if you use the right methods they should be relatively easy to train. They are intelligent, co-operative dogs who are keen to work with their owners. They are also great sources of power and determination. This breed need to be steered into behaviors and manners that fit in with our human world! Rottweilers respond very well to positive reinforcement training. Not only will it teach them good behavior, but it will help to keep their keen mind engaged as well. Training them using motivation and enjoyable experiences is important. Guarding breeds do not respond well to punishment based methods. Exercise is very important for your pup. He will need a couple of good walks each day, in addition to his regular training sessions. Due to their predisposition for heart problems and obesity, keeping your Rottweiler fit and at a healthy weight is very sensible. Sadly, the breed has a lot of potential health problems to contend with. The most common of which are related to their bones. Hip dysplasia is very common in this breed. Only buy a Rottie puppy from parents who both have excellent hips. Rottweilers can also suffer from elbow dysplasia. If you are buying a Rottweiler puppy, make sure that both parents have great elbow scores. This reduce the chances of your puppy developing it as he grows. 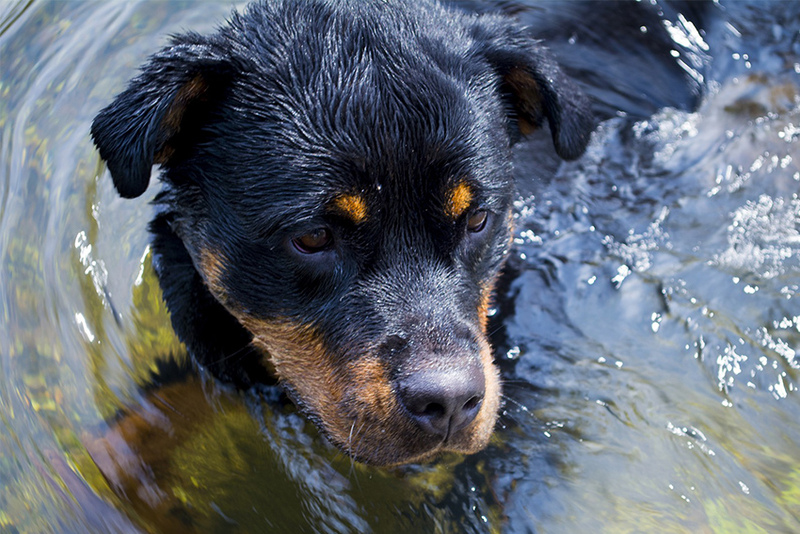 Rottweilers have a high rate of cancer, including osteosarcoma. This is a particularly aggressive form of bone cancer that is found in several of the large and giant breeds of dog. It causes dogs to initially become lame, and as it progresses can result in amputation or sadly require euthanasia. Osteochondrosis of the shoulder, ankle or spine are a risk in the breed. OCD occurs as a result of the bone growing improperly, causing restricted movement and blood flow at the joints. OCD can cause a dog to become lame or develop arthritis without surgery. Panosteitis is an inflammation of the leg bones, common in large and giant breeds of dogs. The condition does pass after a time, but can be very painful for the dog and result in severe limping and lameness. It occurs most often in younger dogs, and is treated with anti-inflammatories and restricted exercise. SAS is a type of heart disease often associated with the Rottweilers. It causes a lack of blood flow from the heart to the aorta. This can result in an otherwise apparently healthy dog suddenly dropping dead without warning. There is a DNA test for SAS. To avoid serious heartbreak down the line, make sure that both of your potential pup’s parents are clear. Hypothyroidism in Rottweilers occurs when their thyroid gland does not produce the quantity of hormones it is supposed to. This results in all sorts of symptoms including tiredness, weakness, loss of hair and appetite. It is a fairly common health problem in several larger breeds of dogs, and one which usually becomes apparent after around 4 years of age. vWD is a bleeding disorder, similar to haemophilia. Dogs with vWD don’t clot properly and can continue bleeding for protracted amounts of time after injury. PRA blindness is fairly common in many of the pedigree dog breeds. Fortunately, it has a DNA test and can therefore be avoided by potential puppy owners. Make sure that your pup’s parents are both PRA clear, or that only one is a carrier. As with many larger dog breeds, Rottweilers can be prone to bloat. Where the stomach becomes distended with gas. You can reduce the chances of your dog getting bloat by helping them to slow down their eating pace with a slow feeder. And by keeping their food bowls at ground level. Rottweilers live on average between just 8 and 9 years, according to two large studies on mortality in dogs. Do Rottweilers make good family pets? Rottweilers can suffer from serious separation anxiety if not given the attention that they want. They therefore need to spend most of their time in the company of a member of their family. They are not clingy dogs in general who will need constant physical contact. However they do want to be in your proximity. If you leave the room, they will probably get up and follow you. Rotties are therefore not suited to families who work away from home for much of the day. Or who take part in activities where a dog would not be welcome. 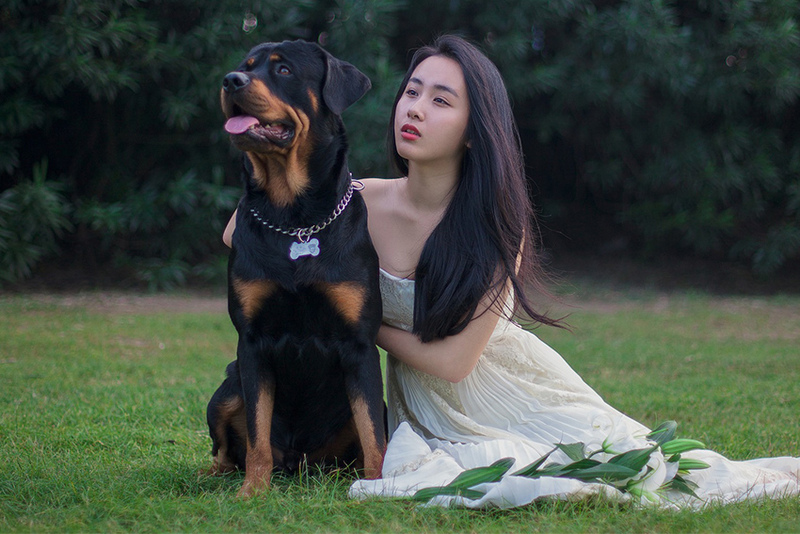 Rottweilers are not normally advised as pets for homes with young kids. Even the kindest, calmest Rottweiler is still a very big dog. This means that he could accidentally knock over a small child. They can be wary of their visiting friends or on rare occasions mistake them for prey . Especially when confronted with their strange noises or behavior. Rottweiler socialisation is essential from the week that you bring your puppy home. Give your new puppy a day to settle into their house, then start on a programme of intense socialisation. Ensure that you have at least one new visitor to the house every day. Make sure that they come with treats and lots of positive interactions for your puppy. Help them to learn from the word go that anyone who arrives on your property is a lovely friend. Try to have a range of different types of people come to visit, especially those with children. Until their vaccinations have been completed, carry your pup with you everywhere you go. Make sure they meet and interact with everyone you can. Young, old, bearded, wearing hats. The more people your puppy sees and meets, the better. Many potential owners find the idea of rescuing appealing. You are giving a dog a second chance. And often avoid the trials and tribulations of puppy potty training. Although you will need to make sure they don’t have any bad habits that you don’t feel ready to handle. You can find a list of Rottweiler Rescues at the end of this article. Only visit breeders who are committed to full health testing, and who are happy for you to view both of the parents. Once you have found a breeder than you are happy with, you will need to wait for them to have a litter of puppies. Some breeders will only have one litter a year, and this will usually be in the Spring or Summer time. It is entirely worth waiting a few months for the right puppy. Good breeders often reserve all the pups in the litter before they are even born. However, most will not require a deposit until they are at least three weeks old and you have had the opportunity to visit them. Be wary of a breeder who asks for a full payment before you have had a chance to view the litter or parents. The puppies should be playful and confident, not shying away from visitors but rushing up to greet them in a wave of fur. If you are lucky enough to have the pick of your litter, then you will need to decide whether you want a male or female puppy. Make sure that all the pups appear to be in good health. Clear eyes, noses and free breathing is essential. Don’t be afraid to let the breeder lead your choice when it comes to which pup to bring home from the litter. They will be the most familiar with the puppies’ temperaments. Make sure that you meet both parents, as this is a guarding breed so a confident stable nature is essential. The price of a Rottweiler puppy will depend upon where you are located. In the UK it will range from £600 to £1,000, in the US it will be anywhere around $1,500 to $3,000. Bear in mind that the initial buying cost of your puppy will in no way reflect the amount of money he will cost you over his life. Ensure that you are able to budget for weekly food costs, veterinary insurance, annual vaccinations. Not to mention any one off costs including beds, toys and training equipment. Insurance is very important for owners of Rottweilers, as they can have some very serious and expensive health problems. Once your Rottweiler puppy is home, he will need caring for. Some of this will be simple. Lots of love and affection, fun and games. But some parts are trickier. 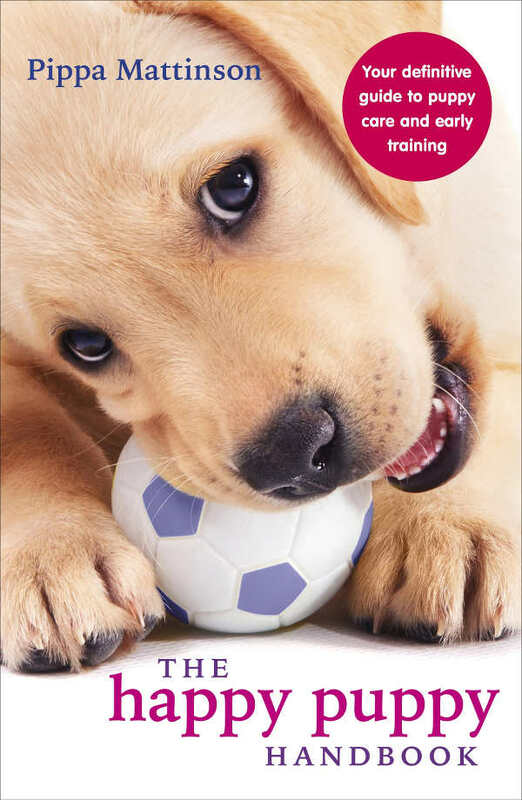 Fortunately, we’ve got a whole site full of puppy training and care articles to help you. You’ll find them listed in our Puppy Care section here. If you like the look of a Rottweiler but are worried about their guarding, then you might be considering a Rottie mix. Remember that a cross breed can display any part of the parent’s temperament. So your Labrador Rottie mix might look like a Lab but have the character of a Rottweiler. Make sure you get to know both breeds well before you settle for your mix. 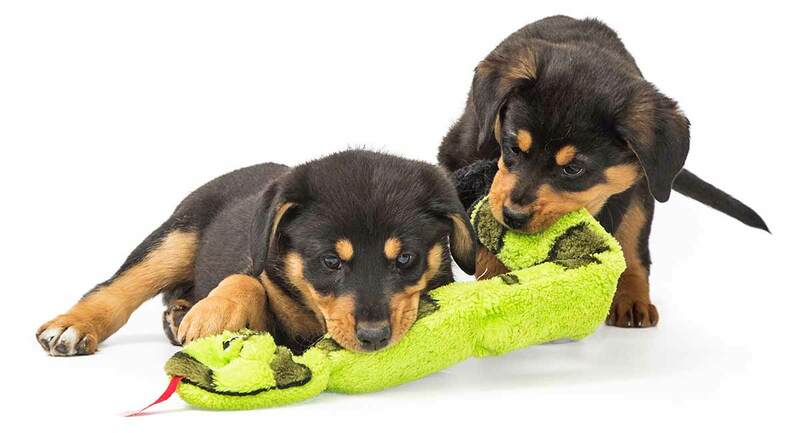 Whether your new dog is a Rottie or a Rottweiler mix, you will need a lot of kit to keep him happy. Rottweilers’ benefit from a great diet, and good coat care. Think you’re ready for your Rottie? Then let’s have one last look at those all important Rottweiler pros and cons. Rottweilers are an iconic breed. But they aren’t right for everyone. Rotties are easily bored. And when they are bored, they break stuff. They don’t like to be alone, and can develop separation anxiety if left too often. The breed can be aggressive toward strangers. When they do attack it’s a serious business, due to their size and strength. They have a number of serious health problems. This breed loves their families. They are utterly devoted, and want to remain by your side constantly. They will be loyal to and protective of their owners. With great socialization and a careful choice of parents, they can mix well with others. If you choose your pup from health tested parents they have better odds of a healthy life. Worried about the cons we’ve looked at above? Then you might be a better fit for another breed. Alternatively, you might like to consider another similar breed. You can find a local Rottweiler rehoming center in the USA via the Rottweiler Rescue Foundation. If you know of any Rottweiler Rescues we’ve missed, please comment below. This is great! Throughout my life I was accompanied by this breed. I got to say this article made me laugh and smile several times because especially the passage about temperament was described perfectly. When we had our third one, for me the first one who arrived as a puppy, he chewed on one particular shoe and one chair every time we didin’t watch him. Out of pure boredom. Anyway, it’s a great article! I love this breed. For me they are the most amazing dog breed. Just one thing was a little confusing for me.. So far every Rottweiler we had, lived over 10 years. First one 13, second one 11 and our current one is 11 as well. Our ADRK registered Rottie is a medical alert/ service go for my son and is amazing in every way. Never aggressive to anyone and travels with my son on planes 3 timers a year when he goes out of the U.S. for research and treatment. He is 150LBS. But perfectly proportioned. I have to walk him as my son can’t and he is a favorite amoung the people in our neighborhood. I have never had to mussel him. He spends all night on my sons bed monitoring him for which he receives a “ frosty paws” ice cream cup the next morning.